A great car... but you need to know more about it. Yeah, admit it. If you're looking for some details about what I have done to my car, see the changes and repairs page. Otherwise, read on for the specs of the ST170 engine. 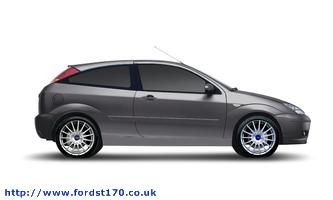 At its heart is a tuned version of the 130PS 2.0-litre Ford Focus Duratec engine, producing 170PS at 7000rpm and 195Nm of torque from 2500rpm. Transmitted through a Durashift six-speed manual gearbox, this is sufficient to allow the Ford Focus ST170 to achieve 0-62mph in 8.2 seconds and a top speed of 133mph. The lightweight, high-efficiency DOHC, 16-valve petrol engine develop 126 kW from the 2.0-litre Duratec ST engine. The engine offer high levels of smoothness, refinement and fuel economy. Low-profile 215/45/R17 tyres mounted on exclusive 15-spoke, 17x7-inch alloy wheels put the power to the road. The combination gives ST170 a poised stance and precise dynamics capabilities to match. Its lateral acceleration, 0.89 g, is an impressive indication of its roadholding abilities. Larger bore free-flowing stainless steel exhaust system, tuned for enhanced performance sound. A 65 mm large-bore, stainless steel tubular exhaust system with less restrictive catalytic converters. 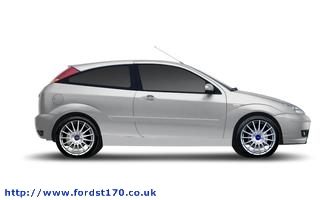 Here are the basic specification of the Ford Focus ST170 car. Comfort Pack - Electronic Automatic Air Conditioning, Quickclear Windscreen and Xenon Headlamps. The 6-speed manual transaxle is a three-shaft design with four fixed gear wheels on the input shaft and seven gear wheels on the two output shafts with a maximum input torque of 200 Nm. In conventional transmissions/transaxles an input shaft transmits the torque to an output shaft on which the gear wheels are seated. The number of gears therefore determines the length of the transmission casing. The 6-speed manual transaxle does not require an increase in the casing length to accommodate the six gears; this is achieved by using two output shafts. Using two output shafts allows the transaxle to be significantly shorter, enabling installation in a more confined space. Output shaft 2: third, fourth and reverse gear All gears are synchronized, including the reverse gear. The gear wheels on the input shaft are fixed to the shaft. The output shafts and the input shaft are supported by roller bearings (clutch housing), sealed ball bearings are used in the transaxle housing. The center distance between the input shaft and the differential is 187.85 mm. The transaxle weight is approximately 46 kg and the overall length is 332 mm including the clutch housing. Type: Dual circuit, diagonally split, hydraulically operated discs. Vacuum servo assisted with standard electronically controlled four-channel, four sensor brake distribution, standard ABS and optional Electronic Stability Programme (ESP).